In a couple of earlier discussions (here and here) we talked about a significant buildup of treasury short positions. Since then there are indications that a few of the larger direct players have been covering their short bond exposure, pushing treasury yields lower. If the emerging markets contagion (discussed here) persists, more short covering is expected. But what about the longer-term outlook for treasuries? As the Fed cuts its buying program, we are left with two major categories of purchasers - foreign and private domestic. Foreign buying is directly linked to growth in current account surplus of key US trading partners, particularly in Asia. And while nations like China and Japan hold enormous amounts of US government paper, it's unclear if they will return to the volumes of purchases from 5 years ago. 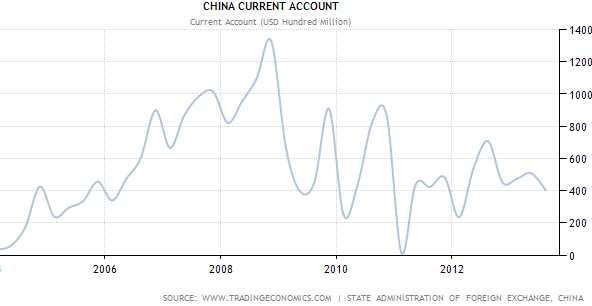 For example the explosive growth in China's current account surplus through 2009 is no longer there, which should translate to a more modest rate of treasury buying. Other emerging economies are not faring much better and in fact many are struggling to maintain export growth. As a result fewer dollars on a relative basis will be available to buy treasuries. The other group of foreigners who have been buying significant amounts of treasuries are the oil exporters. In fact some research links growth in the so-called "petrodollars" (proceeds from energy sales) to higher treasury purchases. But as the US reliance of foreign oil declines, fewer petrodollars should result in relatively smaller purchases of US bonds. This means that foreign purchases of treasuries are unlikely to grow significantly from current levels. That leaves US domestic investors to pick up the slack left behind by the Fed and foreign buyers. Based on the projections from Sandler O’Neill, domestic buyers will be called upon to buy an increasingly larger share of government paper going forward. Rising yields in the intermediate and possibly longer term is an inevitability - the only way to attract domestic buyers to this growing supply. And it's not just the longer term rates that will increase as the result of this shift to private domestic buyers. Sandler O'Neill points out that as the longer term rates rise, the Fed will be forced to raise the overnight rate. This may end up being less about the US employment situation and more about keeping the yield curve "steepness" (see post) from becoming extreme. One of the reasons short term rate adjustment will be an imperative is the risk of a new buildup in the so-called carry trade. Sandler O'Neill: - This also leaves a quandary for short term interest rate policy. Should the 10-Year reach 4%, the spread over Fed Funds will be confronting its well-defined historical peak. In our view, the Fed would be highly likely to adjust the policy rate upwards in this situation to avoid further market distortions and a potential explosion in carry trade and other counterproductive rate arbitrage activity. If this is correct, short term interest rates might no longer be simply anchored to employment metrics. The Fed's taper, combined with weaker foreign purchases of treasuries, will leave private domestic investors to take on an increasingly larger portion of treasury purchases. The only way to attract more domestic buyers is with higher yields - which will ultimately result in rising rates across the curve.